Wouldn’t it be great if you could find the best wireless TV headphones in the UK, Canada, or Australia? A quality headphone whose audio has the highest degree of clarity ensures that while you're watching TV, what you hear is as clear as possible and most especially to the highest volume you choose. Since you'll be able to make out the words easily, you can listen to your favorite songs and watch your favorite movies/TV shows that have even been streamed from a wireless video transmitter. You're sharing your home with an elderly person or you have a sleeping child around but you really need to see whats on the news, catch up all the action on your favorite sports channel, or start a gaming session. How about trying to watch some late night movies on Netflix when the wall between you and your neighbor isn't as thick as you'd expect. You'll either set the TV to the lowest volume or turn it off entirely in order not to disturb them. Now that would not be the case if you had one of the best wireless headphones for TV and music lying around. Your partner, kids, grandparents, and neighbors can be undisturbed while you don't deny yourself those few hours of much-needed relaxation and entertainment. A headset with an acceptable price tag and one that can stand the test of time while offering you the best audio quality in a bid to enhance your home entertainment would be your best buy. This and many more is what you'll find in our wireless headphones for TV review. A wireless headphone allows you to connect to a audio/video source such as a Television, Computer, DVD & Blu-Ray players, iOS smartphone or any other tech gadget wirelessly. It is devoid of cables and as such, physical connections are not required to transmit audio from the source device to the headphone. Basically, they make use of different wireless headphone technologies such as Radio Frequency (RF), Bluetooth, and Infrared (IR). Without much thought, the major difference between a wired and wireless headphone is the presence of cords in one and the absence in the latter. Asides that, there's so much more which set these two devices apart. If you are going to settle for a wireless headphone, you may as well prepare to buy spare batteries to keep it powered in case the power runs out and there's no base Transmitter to charge it. This means that these are rechargeable wireless TV headphones whose batteries can keep them running for about 20 hours but may still require that you prepare for any uncertainties. Traditional headphones other than those with an Active Noise Canceling (ANC) feature do not require batteries to be powered since the TV acts as their power source. Most wired headphones are compatible with any TV given that these TVs have a 3.5mm headphone jack port. Any wired headphone you pick up will most certainly work with you TV. You may need a dedicated wireless headphone for TV to ensure that you don't run into compatibility problems. If you decide to buy a wireless Bluetooth headphone that supports aptX low latency Bluetooth profile, you also need a TV that supports this codec or buy a Transmitter to minimize latency. Wired headphones do not experience a delay in transmitting audio data to the receiver, but the same cannot be said for wireless headphones. Depending on the technology such as Bluetooth used for the latter, the transfer of packets of data may be delayed, hence leading to audio lagging behind the video played. Some wireless Bluetooth headphones support aptX low latency codecs such as ApTX LL in order to minimize static or delay and they also have a low latency. Are you wondering why you should trade those pair of wired headphones you've become accustomed to for a wireless headphone? Then it'll take a little convincing on our part to make you see reasons why you should buy a wireless headphone for watching TV. When it comes to using wired TV headphones, distance is often a limitation since the length of the cable determines how far enough you can sit from your Television. If you have a TV such as an HDTV with great picture quality whose screen can still be viewed from certain distances, then you'll come to appreciate a wireless TV headphone more. They have a long range where the line of sight between the Transmitter and Receiver is long. As a result, you can use them a few feet away from your TV, move to the kitchen or bedroom, and still get the best audio clarity. In terms of performance, wireless headsets for TV would be your best buy. Manufacturers like Sennheiser, Panasonic, Bose, Samsung, Sony, and LG have focused on designing headphones with high-end specs and these are mostly wireless headphones. Better performance since the sound quality has been enhanced using the latest technology. This should not come as a surprise given the number of people that are constantly searching for the best Bose or Sony wireless headphones for TV. Some wireless headphones are more compatible with audio devices and as such, the sound may tend to lag if used they are for a TV. Some of the best wireless headphones For Watching TV have a noise-reduction technology that helps to isolate the sound. Is to tune out the noise in the background in order to enhance the sound quality. As a result, all you'll hear is what's coming directly from the headphone's speakers. Are you sick and tired of dealing with cables? Ones that tangle easily or become faulty if you don't handle the cord with care? You're not alone, so are we. Consequently, a wireless headphone promises the best comfort while you're watching TV. Some are lightweight and have padded headbands with comfortable earpads. You can sit, stand, lie, and even walk to the fridge for a drink or microwave some popcorn without having to worry about mishandling the cables or losing connection. They're not all the same! There are different types of wireless TV headphones, and each can be differentiated by its transmitting technology and mode of operation. RF Headphones for TV requires a connection between a Transmitter and a source device before they can work. In this case, your TV, Laptop, or sound system is the source. The mode of connection is dependent on your TV and Transmitter and as such, it can be made through RCA or 3.5mm outputs (analog) as well as digital optical audio or coaxial audio outputs. This type of headphones have several frequencies and enable you (manually or automatically) to find the ideal frequency to prevent delays. Now, consider this if you want to buy wireless RF home theater headphones. If their line of sight is blocked by a thick object such as a metal or thick wall, the quality of sound may be still affected. Like the working operation of the RF headphone system, an IR also needs to a Transmitter to establish a connection between the TV and the headphone. This IR transmitter sends Infrared signals to your headphones that helps in receiving audio data. When the path between the transmitter and receiver is blocked by an object, the quality of sound can be affected. You'll hardly find this type of headphones in the market due to their discontinued production thereby making dedicated RF TV headphones, gaming headsets and Bluetooth headphones more popular. Bluetooth Headphones For TV are the most popular. There are several reasons to back up their popularity and that includes the ability to transmit information without necessarily requiring a Transmitter. 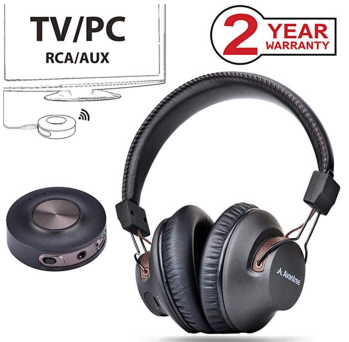 Other than using these type of headphones with a TV, you can also use them with several other Bluetooth enabled devices such as a PC, Mac, Android/iOS smartphone and so much more. Some Bluetooth headphones may not be compatible with your TV and as such may need a Transmitter, hence you need to ensure there is support for your TV. Given below, is a list of the best RF and Bluetooth TV Headsets in 2018 to complement your home entertainment system. They have been chosen based on their sound quality, range, comfort, tech specs, and most especially, the reviews of buyers on Amazon. Sennheiser RS120 on-ear wireless RF headphone is one of the best if not the most popular headphone you'll find on Amazon, eBay, Walmart and other online stores. Sennheiser is a reputable German manufacturer of headsets that are reliable, hence one of this nature is bound not to disappoint. Looking for the best TV headphones under $100? Then try one of these. For a convenient movie watching, this headphone has a light weight of 7.05 ounces and it comes with a padded headband. This provides a comfortable feel which will enable you to use for it long hours without feeling like you have an extra load on your head or putting a lot of pressure on it. Taking advantage of the Radio Frequency technology, the sound is received from the transmitter base through an analog output connection with the TV. Inline with that, you can choose from three RF Channels (926, 927, 928 MHz) in order to find the ideal channel without static noise or distortion. At a range of 300ft, you can move around freely with this headset without any interference by wall, ceilings or doors. Like most wireless headsets, its AAA NiMH batteries placed in the headphone ear cup are rechargeable. Since you can remove and insert the batteries, you don't have to replace the entire headphone when the battery degrades. To recharge, all you have to do is place the headphone on the Transmitter base and then it begins charging wirelessly. This Transmitter can automatically power on or off when connected or disconnected (after 5 minutes) from an audio source in order to use battery power efficiently. You can use this headphone with a TV, Computer, Tablets, MP3 players, Hi-Fi audio and expect good clarity. Equally, you can have the confidence that the battery will last for up to 20 hours after a full charge. Packaged with an audio cable with RCA jacks and power supply wall adapter. 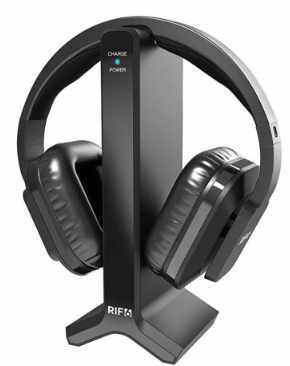 Another wireless headset that is a force to reckon with and one of the best RF headphones is the RIF6. In terms of its design, it has a plastic build with square-shaped earcups and earpads. In addition, it has a lightweight, and an adjustable soft padded headband to give a comfortable feel while it's being used. Other than having an elegant design, it holds a promise of providing good sound quality while at the same time conserving power. The RIF6 Wireless Headphone for TV makes use of an RF Transmitter to charge the headphone and also connect to an audivideo source. This Transmitter is able to automatically select the ideal frequency from a wide range of 31 channels to ensure that you get crisp and clear sound without any distortion. Its range of coverage is 100ft from the base which is suitable for a moderately sized room where you may not have a need to move longer distances while the headphone is on. You can connect it to your TV, Hi-Fi radio, MP3, or iPod wirelessly, move to the fridge and grab a drink removing it from the line of sight of the Transmitter. To power the headphones are two NI-MH batteries and in comparison with the Sennheiser RS120, these batteries can be recharged by placing it on the base of the Transmitter (charging dock). On a full charge, you can expect up to 20 hours of usage before there is a need to recharge. It's also important to know that these batteries are removable allowing for a quick change if there is a need for replacement. You can mute the sound and control the volume directly from the headphone using its control buttons which takes away the need to get up and use the Tv's remote. There is a 3.5mm jack on this headphone which means that if you're a die-hard lover of cables, you'll still be able to use a cable to connect it to an audio source. Although this headphone does not have a noise-canceling technology, it is still able to separate the sound from your source with background noise. Do you want a headphone system that connects via Bluetooth? Then the Avantree HT3189 Wireless Headphone with no lip sync delay is a good choice for TV watching & PC gaming. This headset comes with a Bluetooth Transmitter (Priva III) that automatically connects when the Transmitter and Bluetooth on the headphone (AS9S) are turned on. 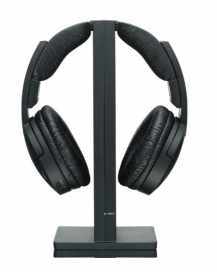 This is a Plug and Play wireless TV headphone since the set up is very easy. You can use it with AUX or RCA audio outputs on TVs / DVD players and digital USB audio output on PC, MAC, or PS4. This headphone is compatible with a TV that has a headphone jack or RCA audio output port. The operation range is up to 100ft allowing you to move freely without any restrictions. On the other hand, Interference may occur when the line of sight is blocked by a wall, person, or an object. As another downside, it is incompatible with TVs that have a digital audio output or whose audio ports are non-functional and as such, you need to ensure your TV is supported and also test its ports with a cable before acquiring this headset. These aside, you can get this headphone for yourself, hearing impaired, or an elderly person. Powered by batteries, you can expect up to 40 hours of music play time with the Avantree HT3189 Wireless headphone. 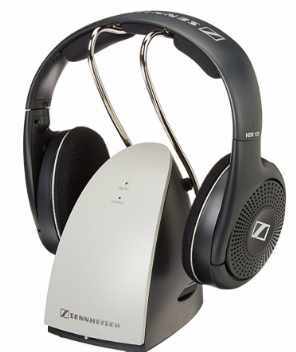 Another wireless TV headphones on Amazon that people have come to love is the Sennheiser RS 175. According to a buyer Wood B. Hermit, it is 'An ear-opening experience whether or not you are hearing impaired'. It's left for you to find out. 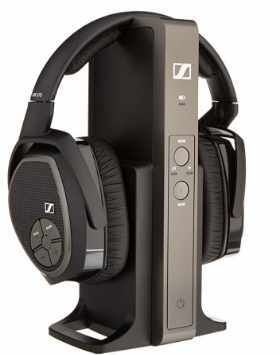 Compared to the Sennheiser RS 120, this high-end model is more expensive but offers more capabilities. It comes with an RF Transmitter which will ensure that signals are not interfered by objects. The nature of its design helps to block out noise in the background thereby maintaining the quality of sound. You don't disturb others since you're using a headphone and you don't get distracted by the surrounding noise. Unlike a Bluetooth headphone that may be compatible with only one audio output, this headphone supports both optical digital and analog audio outputs. As a result, you can connect your TV via a digital optical cable, and a PC/iPad using a 3.5mm audio cable. The operating range of this headphone system is 330ft. The line of sight between the transmitter and receiver is quite long which will allow you to move long distances even while listening to your favorite songs or watching the news. Powering this headset are two NiMH batteries that are wirelessly rechargeable by placing the headset on the charging dock. On a full charge, the batteries can last up to 18 hours before running out of power. Sony wireless headphones are competitors when it comes to sound system. You can find several quality Wireless headphones with either RF, Bluetooth, or IR technology from this brand. One of such is the Sony MDRRF985RK, an RF headphone that promises audio clarity while watching TV or gaming on PC. This is made possible with an automatic tuning that searches for the ideal frequency between 3 channels (915.5 MHz, 916MHz, 916.5MHz) in order to minimize distortion. This headphone comes with a Noise reduction system in a bid to tune out the noise in the surrounding. Its adjustable headband has been well padded to provide comfort and its light weight will ensure that you can use it for hours without feeling like an extra load. The wireless operating distance of 150 ft between the Transmitter and the headphone ensures that while you move freely in your home. the sound quality is maintained. You'll find Lithium-Ion batteries powering this over-the-head earpiece and ones that can provide up to 25 hours of battery life. This battery can be charged wirelessly by placing it on the charging dock and you can replace the battery if it degrades. How Were These Wireless Headphones Selected? RF and Bluetooth headphone technologies are better than IR headphone technology due to the fact that interference can easily occur in the latter when the path between the Transmitter and Receiver is blocked. For this reason, you'll only find the remarkable Avantree HT3189 Wireless Headphone featuring a Bluetooth technology while the rest have an RF technology. When it comes to providing support for TVs, the RF transmitters of our selected headphones have both digital and analog inputs to make it compatible with a large number of TVs. The range determines the line of sight between the Transmitter and Receiver before signal is interfered. A longer range means that the signal strength will still be stronger when certain distances have been moved by the user and without objects blocking this path. Thus, a range of at least 100ft is recommendable, and our selected headphones have met this requirement. How long the headphone will stay powered on is an important factor in determining if it is the best buy. While you want a headset that can offer crisp and clear sound, you might also need one that can last for up to 20 hours or more before there is a need to recharge. Also, battery power must be managed efficiently by using a feature such as an auto turn on/off feature when the source is connected or disconnected. Moreover, you can charge these batteries by placing them on the base transmitter and you can replace them instead of going to buy a new Wireless TV headphone due to battery problems. The best wireless headset specially made for TV will have no sound delay. This can be made possible if the headphone has a low latency between 30ms to 50ms. In the case of a Bluetooth headphone, it must support aptX Bluetooth profile and made to work with a TV that supports this profile to minimize lags. Other wireless headphones made for only audio devices may not encounter this delay, but the same may not be the case when it is plugged to a video source. In line with that, our selected Avantree HT3189 Wireless Bluetooth headset has a latency less than 40ms and it also supports aptX which makes it suitable for TV. Equally, when picking out any other Bluetooth headphone, check the box the product comes in to verify that it supports aptX Bluetooth profile and does not have a high latency. Our sure banker in determining the quality of each wireless headphone was the reviews and recommendations of verified buyers on Amazon. This is because it helped us to determine the limitations of each and their selling point. Thus, we were able to compare them amongst others out there and then narrow down to these five. These are the features you should consider when buying a wireless TV headphone in 2018. The best wireless TV headphones with charging dock can enhance your level of experience while gaming, watching movies, and listening to music. Now, you don't have to worry about which brand or type to settle on given our review of the best buys in the US, UK, and Australia. If you're tired of dealing with cables from a wired headphone and you also want the best multimedia experience even if your hearing is impaired, then go ahead anf give one of these headsets a try. With its great sound quality combined with noise canceling technology, it'll come in handy when you need it most.